The WSD F10 smart outdoor watch by Casio is designed for the outdoor adventurer who wants to track their fitness stats including steps taken, route, and more. This newest model by Casio is designed for the hiker, cyclist, or runner. It comes loaded with some great features including a compass and barometer and even offers unique features such as tide charts. A watch that the outdoorsmen will not want to leave home without, Casio offers a new take on fitness trackers, including activities that are specifically designed for the angler or hiker. Casio offers an interesting take on the traditional fitness tracker, instead focusing on outdoor specific activities that the hiker and cyclist can appreciate. However, this type of limitation makes this model a bad choice if you often workout at the gym and need a fitness tracker that can closely monitor your progress and keep close tabs on your stats. Our Verdict: This isn’t your traditional fitness tracker. Instead, Casio offers a fitness tracker that’s geared toward the hiker, angler, runner, or cyclist. If you need a fitness tracker that’s geared toward gym workouts and can provide great fitness tips for girls, then this isn’t the model for you. Instead, it focuses mainly on outdoor activities and comes loaded with features that hikers, runners, and fishermen will love. Continue reading to find out why this outdoor fitness tracker scored well in almost every area. This Android wear fitness tracker is designed for hikers, anglers, runners, and cyclists. 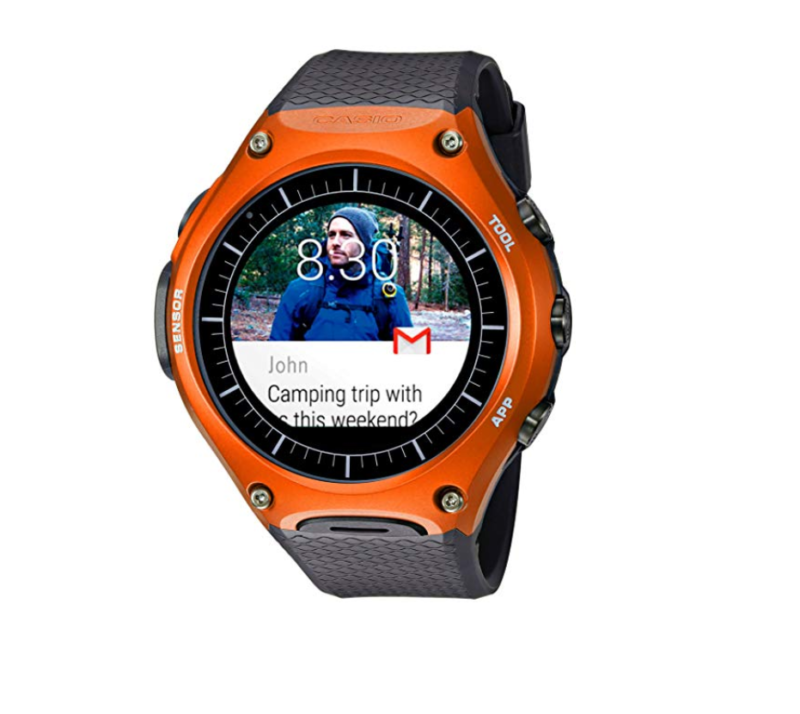 However, considering this model is designed for the outdoorsmen, it comes as a big surprise that it’s not equipped with a heart rate monitoring feature or even onboard GPS. Additionally, while Casio markets this fitness tracker for both iOS and Android users, in reality, many of the tracker’s features cannot be accessed when paired with an iOS device. Because of this, we’re categorizing this model as an Android fitness tracker. If you’re searching for a fitness tracker without all the flash and one that excels at tracking outdoor activities, then this model will be a great fit. Unlike newer models of fitness trackers, Casio clearly hasn’t gotten the memo regarding design and has instead continued to produce their line of fitness trackers using heavy, thick, and bulky designs that can make this model uncomfortable to wear for an extended period of time. Aside from the bulky watch, the included strap is made out of a tough, stiff, chunky plastic that also lends to the fitness tracker’s reputation for being uncomfortable and awkward. The fitness tracker comes with three buttons, one of which is called the app button and it can be used as a shortcut to a selected Android Wear app. The tool button allows you to breeze through a variety of features such as the tide charts, compass, barometer, and an altimeter. The last button is called the function button and it allows you to switch display modes. The display screen measures in at just under an inch and a half. It features an LCD monochrome design and a pixel color screen. You can use the function button to go from the monochrome screen to the full-color display. The monochrome screen will show the time and date. Unfortunately, in both display screen modes, it can be difficult to read any data in bright sunlight. This is a tough waterproof fitness tracker that can handle water as deep as one hundred and sixty-four feet. In order to get started, you’ll first need to download the Android Wear app. There are a variety of apps to choose from in the Google Play store. You can assign different apps to the tool button for faster access. This watch doesn’t focus on gym-like workouts, so you won’t be able to add machines, strength training exercises, or cardio workouts like you can with competing models such as the Samsung Galaxy SM-R800NZSAXAR Smartwatch. As we mentioned earlier, this is a fitness tracker that’s strictly designed for outdoor activities. This type of limitation will make the gym goer and cardio bunny look elsewhere for a more versatile fitness tracking model. To learn more about fitness trackers and the other leading models on the market, click here to check out our buyer’s guide. This model features a magnetometer, barometer, altimeter, and an accelerometer. Click on the tool button to view the data for each of these sensors. As we briefly touched on earlier, this fitness tracker doesn’t come with onboard GPS, which is puzzling considering this fitness tracker is designed for the hiker and general outdoor enthusiast. Without GPS it can be incredibly difficult to get accurate data back regarding distance traveled, steps taken, and more. Additionally, you won’t be able to save and store a route on your fitness tracker, a feature that’s available for most models that offer onboard GPS capability. This Casio fitness tracker boasts a one-month battery life, which isn’t too impressive considering it doesn’t have built-in GPS, the number one feature that is notorious for draining the battery. This outdoor fitness tracker by Casio doesn’t come loaded with all of the bells and whistles the gym rat or even the outdoor enthusiast is looking for. The lack of GPS functionality will be a major drawback for users who don’t want to rely on their smartphone for GPS navigation. However, the fitness tracker does provide a reliable performance when you’re fishing, hiking, or running. The wide range of sensors will help to keep you on track toward your fitness goals. If you’re looking for a smartwatch companion to your Android phone, then this Casio model will be a great fit. iOS users who don’t want to spend big on a fitness tracker with limited capabilities when used with an iOS device will need to keep looking. We gave this model a rating of four and a half stars out of five stars for ease of use, the variety of sensors, intuitive controls, and overall quality.